Red White and Beautiful Tour features performance artist and Outerregion founder Camille Turner transformed as a beauty queen who has traveled the world since 2002 representing Canada. The Red White and Beautiful Tour has been an ongoing series that has captured the attention of the media, academics and the general public. Making appearances as Miss Canadiana, an “official” symbol of Canada, challenges assumptions about Canadian identity and normative beauty. Extensive exposure in print, radio and TV as well as an NFB documentary broadcast on CBC has played an important role in publicizing the work. Since 2002 this inter-cultural engagement has been presented in exhibitions, festivals and public venues in Canada, Australia, UK, Germany, Senegal and Mexico and continues to attract attention. Outerregion is about to embark on a new project series featuring Miss Canadiana leading a series of Heritage and Culture Walking Tours across Canada. Subscribe to our Blog for updates. This afrofuturist performance/media project is a collaborative work developed and performed by Camille Turner, Sobaz Benjamin, Karen Turner and Lee Turner. It features a group of space travelers, descendants of the Dogon people of West Africa who have returned to earth after 10,000 years to save the planet. The resulting documentation of the performances and the responses of people interacting with the astronauts has been incorporated into an installation that was presented as a solo show at W.A.R.C gallery in Toronto in 2007 and as an off-site exhibition at the Southern Alberta Art Gallery in Lethbridge, Alberta in 2008. The Final Frontier was featured in the TRUTH or FICTION? from April 6 – May 22 at the Kamloops Art Gallery. The exhibition brought together the work of five artists: Doug Buis (Knutsford/Kamloops), Rodney Graham (Vancouver), Kent Monkman (Toronto), Carol Sawyer (Vancouver) and Camille Turner (Toronto). All the works in the show refered to history and historical narratives, past, present and future; they include historical figures, but also little known, dubious and perhaps fictional characters; and, despite being about the past, present and future, they are more interested in representation than in mimesis—rather than mimic reality they represent it, with all its ambiguities and uncertainties. This is a trailer for a documentary of the performance work chronicling the adventures of the space travelers and their impact on communities they encounter on their travels. 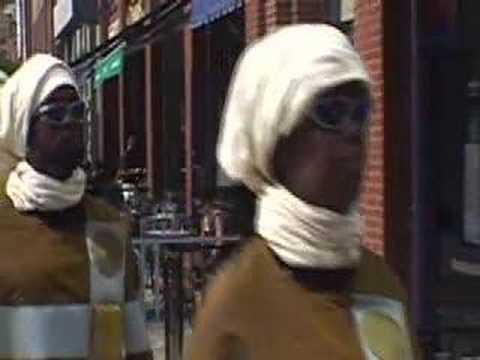 The Space Travelers land in Toronto and are seen wandering through the streets. Here’s how Toronto responded to their strange visitors.